Award-winning artist, Victoria Melody, explores the affect of laughter on the brain! 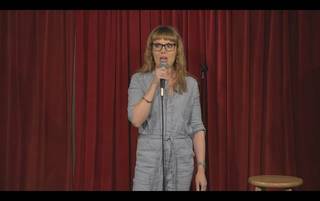 Award-winning artist, Victoria Melody, presents a work-in-progress about her attempts at becoming a stand-up comedian. Wearing technology that shows in real time what happens to the brain when you tell jokes, Victoria reveals what happened when she immersed herself into the world of British amateur stand-up comedy. Following the performance there will an opportunity to talk to the artist, a creative technologist and a neurologist. There will be two performances, each lasting half an hour.